RateGain, the market leader in BI, distribution & revenue management, for travel & hospitality industry, today announced its strategic partnership with Condor Ferries, one of the leading operators of passenger & freight ferry services, to streamline and enhance their revenue management capabilities. 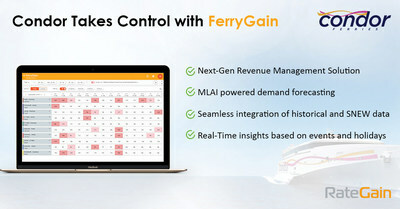 The integration with FerryGain would allow the company to accurately forecast demand of their sailings, and receive effective price recommendations. This partnership is part of Condor's digital strategy to improve customer experience and forecast demand. Commenting on the partnership, Apurva Chamaria, Chief Revenue Officer, RateGain, said, "Condor Ferries is a forward-looking player and is investing in providing a seamless experience to its customers. We are proud to collaborate with them and are confident that integrating with FerryGain would streamline and upscale their revenue management capabilities." Kerry Jalie, Condor Ferries' Head of Change Management & Development, said, "Condor's pricing model is complex as it requires daily, weekly, monthly and seasonal variations in seat inventory along with historic data to allow for accurate forecasting and revenue optimisation. We selected RateGain for their proven experience and expertise in the travel industry and are delighted to be the launch customer for their Product. We are confident that our partnership will prove beneficial for Condor's business." Founded in 1964, Condor Ferries is an operator of passenger & freight ferry services. The company runs the high-speed ferries, Condor Liberation, & Condor Rapide. It also operates Commodore Clipper, a conventional car, passenger & freight-carrying vessel, & Commodore Goodwill, a freight-only ship. Each year, Condor Ferries carries around 800,000 passengers & 200,000 passenger vehicles. RateGain is a leading provider of cloud-based innovative solutions for the Travel & Hospitality Industry. RateGain provides the latest technology in rate intelligence, price optimization, seamless electronic distribution, & brand engagement. In 2018, RateGain acquired DHISCO to become the leading, comprehensive travel & hospitality technology distribution platform. Please visit rategain.com.